← Welcome to Wednesday Wants! Throwback Thursdays – Fabulous dolls of yesteryear. dollbid shares those fun favorites of which we just can’t get enough! dollbid is happy to play host to dolls from our doll history! From Bye-Lo Baby to Kewpie…to Barbie and Gene Marshall – these are dolls with a vintage touch. Click on the image to jump to the auction – or learn more about the doll by following our provided links…enjoy! 1920s Grace Putnam Bye-lo baby doll with bisque head, 8 inches tall and blue glass eyes – learn more about Bye-Lo here and here. Click the image to see the auction, or click here. 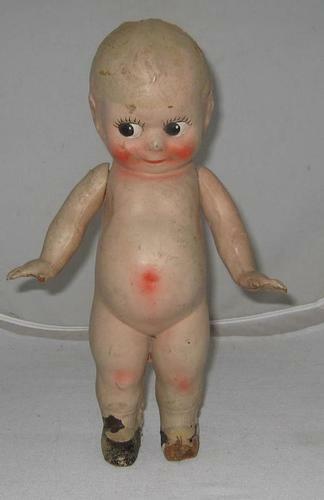 1920s All Composition Kewpie doll with moving hands – 12.5 inches tall – Learn more about Kewpie here. Click the image to see the auction, or click here. 1970-1972 – FRANCIE “HAIR HAPPENIN’S” ALL ORIG MAKEUP – Learn more about Francie here. Click the image to see the auction, or click here. Dress your vintage Francie in THE SLACKS SUIT FASHION WITH STICKER, NRFB. Click the image to see the auction, or click here. SONG OF SPAIN 1999 DRESSED DOLL NRFB – Learn more about Gene’s fabulous history here. Click the image to see the auction, or click here. dollbid has an amazing selection of Gene dolls and outfits currently being offered with great prices! See all Gene Marshall Listings here.